Going old school in music is no longer an alternative to the mainstream, it is one of the commonalities found across all popular genres. It’s a symptom of an industry that is out of ideas and systematically stifles creativity. Funky R&B and the Muscle Shoals sound is the flavor of the day, even in country. This development might sound like something the old soul music listener would stand up and cheer for, but not every new artist is cut out to play old music. Most of them are downright terrible at it. Mainstream country music stars shouldn’t fancy they possess the funkiness and soul of The Meters. That’s because music is either in your blood, or it isn’t. It’s either a sin for someone not to share it because it’s so inherent in them, or they’re just a pretender. You can’t switch the style of your music just because it’s where the trends are headed and expect to produce something lasting. It takes years of discipline and study to result in music that is truly worthwhile. Brothers Jack Torrey and Page Burkum from Minneapolis, Minnesota did not sit down one day and decide that the world was hungry for the second coming of the Everly Brothers and set out to fill that gap. They conjoined their voices together in song and that’s what happened to come out. But it is the study and discipline, and the loyalty to the style that has taken them from filling a niche in neotraditional music, to now releasing an album that will stand the test of time, just like the work of their predecessors. 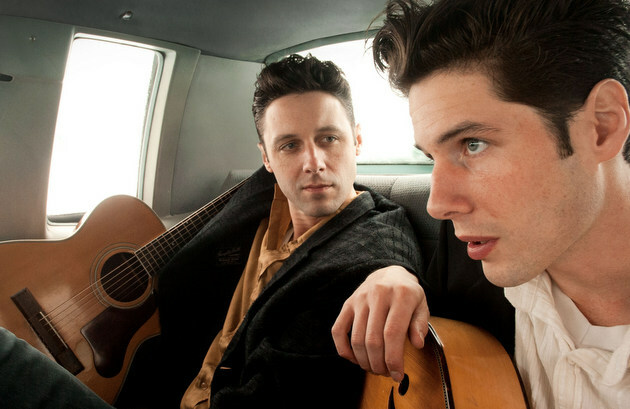 All one had to do was see The Cactus Blossoms live to understand the potential this duo had. Part of the reason the music found such a resonant groove is because it was forged on a stage in front of people at the Turf Club in St. Paul during a now semi-famous residency. That is where the brothers discovered their sound and honed it to the reception of the audience. The brothers have released a couple of albums since their formation in 2010, including the much-coveted Live at the Turf Club, but after the release of Your Dreaming, it’s almost as if these previous releases disappeared. They can no longer be located on their website or on Spotify or other places. You have to go digging to find them. It’s because You’re Dreaming is all you need to know, and the brothers seemed to understand this will be one of those career-defining albums. Under the wide shadow being cast by Dave Cobb and his recent producership efforts, throwback rock and roll musician and songwriter JD McPherson has been putting together one fierce run of excellent albums himself. The Cactus Blossoms were flattered when McPherson called them and wanted to make an album, and the result was magic. As much praise as you can lump on the brothers for this record, possibly McPherson and the backing band he assembled deserve praise in equal measure. The understanding and love they approach these songs with, including never encroaching on the brothers’ harmonies and getting right at the heart of the mood each composition looked to evoke, it’s shiver-inducing. Rarely has sparsity expressed so much. A big concern heading into this album was how the brothers would find a way to demonstrate some variety with their music. Even the greatest of singing pairs can get tiresome to the ears after multiple songs of the same approach, especially when your sound is so stripped down. But You’re Dreaming is deliciously spicy and surprising in its depth of expressions. There’s the billowy love songs like “Powder Blue,” and there’s old fashioned rock and roll with the Alton & Jimmy song “No More Crying The Blues.” The album does so much with so little. This isn’t a project that’s just all about styling either. The 10 originals of You’re Dreaming are touching, insightful, entertaining, and expression-filled. The song that might say the most is “Change Your Ways Or Die.” It feels similar to Hurray For The Riff Raff’s “The Body Electric” from a few years ago in the way that it says so much more than you think at first take, and could go one to define on of the high points in Americana for the coming year. A band like The Cactus Blossoms is still a niche enterprise for sure, and so the appeal won’t be felt by everyone. But the artistry is virtually unmatched, and the result is near perfection. I am very proud these guys represent Minnesota. I feel we have a very special music scene and cannot be more happy for this album to heard by the world! Great review, Trig! Those of us who live in the Twin Cities and have been fans for years, are so pleased TCB are getting some national attention and positive press. They are truly a once in a generation talent inhabited by souls of past artists. Their live shows are so much more than “You’re Dreaming” presents to a new audience. Again, thanks for the great review. I’m looking forward to hearing the rest of it. What I heard was fantastic. Great review, and I’m looking forward to their tour bringing them to Michigan next month. Live at the Turf Club isn’t that hard to find; I recently bought it from cdbaby.com. from the new record, three songs are from the self titled album and one song is from the live cd. highly suggest to anyone picking up them up while they’re still available. the length and those songs are my only knocks on You’re Dreaming. the Everly Brothers comparison is like the Sturgil’s Waylon comparison. it’ll go away. i was kinda worried that McPherson might try to hep it up, give a contemporary vibe somehow. glad that wasn’t the case. and as much as i love the Turf Club (if your a tourist, it’s horrible. stay away ), the CB’S spent a lot time at the VFW Post 246 in Uptown Minneapolis also getting to this point. bands and patrons are forgetting how great some of these places can be for shows…imo. SCM should of got the exclusive stream too. i do really like Garden & Gun though. good for them. I enjoyed hearing these. I will look for more of their videos. When I first saw the song list for this release I was a bit disappointed as a number of tracks had already appeared on other releases. But I shouldn’t have worried: JD McPherson’s production job is excellent and made these particular songs sound even better. 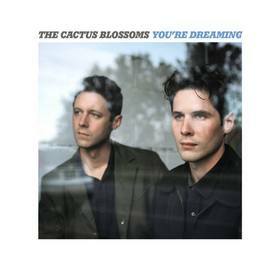 I’m sure this will be the record to break the Cactus Blossoms into the big time. Superb album, easily two guns up! I gave this a listen to Friday when it came out. It wasn’t bad. Harvest Thieves is still my front runner for album of the year so far. I agree. If I want to hear funky horn band music, I’ll listen to something by the people that invented that music. originality in music is important, and now rare, commercially. This is one of the things that’s so good about Sturgill Simpson. His music has roots, but the music his own. Not that some musicians, songwriters, singers aren’t trying to be original, but I guess originality hasn’t been valued much by the people running the business for some time. In the sixties, originality was highly prized, and very few people wanted to sound like somebody else. Everyone wanted to be a pioneer, as well as sell records. The result was the amazing flowering of bands, and styles music that came out of that period. There are people doing original things now… but they don’t get much attention. YES! So excited about this album! Wonderful review Trigger. Loved your points on originality and craft. When I heard Mississippi debut on SoundCloud I was floored. I listened to it over and over. I saw the Cactus Blossoms play here in Portland as part of a mini festival Caleb Klauder put together. Just as a duo they were so powerful. I am so glad these two are able to pursue their muse. Trigger, thank you for introducing me to this fantastic album and group! Any idea why this isn’t available on iTunes or Apple Music? I don’t know. It’s available on Spotify so I’m a bit surprised it wouldn’t be there. Perhaps it will show up later.